Leopard geckos are nocturnal, terrestrial geckos, native to Iran, Iraq, Afghanistan, Pakistan and western India. Capable but small, these 8-inch-long predators will stalk, capture and consume virtually any creature they can overpower. While insect and other invertebrates form the bulk of their diet, they will readily prey on nestling rodents or lizards -- including hatchling leopard geckos. Unlike some other geckos that thrive on prepared diets, pet leopard geckos require live insects. Leopard geckos will not eat fruits or vegetables of any kind. In captivity, leopard geckos thrive on a varied diet of commercially available insects: crickets, mealworms, superworms and roaches are excellent dietary staples. Whatever feeder insects you choose, feed them a high-quality diet of fruits, vegetables and grains for at least 24 hours before offering them to your lizard. 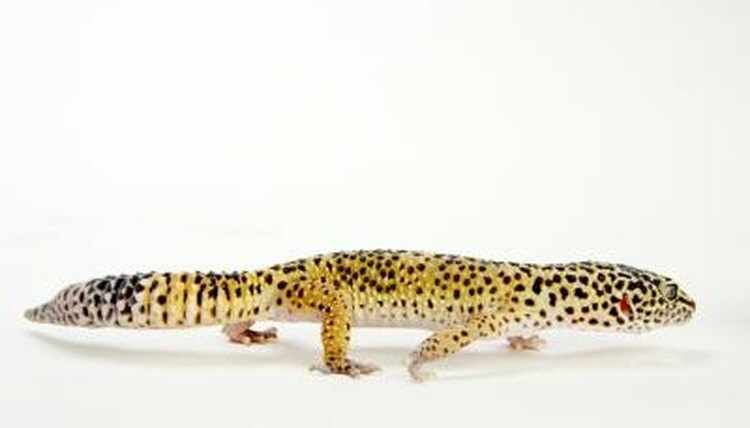 Refrain from offering your leopard gecko pinky mice, which may cause nutritional problems, or lizards that may transmit parasites or disease to your pet.